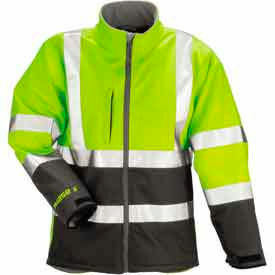 Refrigiwear HiVis™ Jackoat™ Jackets Are Used For Extra Visibility In Cold And Dark Worksites. Tingley® Phase 3™ Soft Shell Jackets Are Used For Emergency Response, Roadway Construction, Railway Maintenance And Other Industrial And Commercial Worksites. Tingley® Phase 3™ Soft Shell Jackets are made of trilaminated polyester for long lasting durability. Cold weather protection clothing provides 3-season protection that is wind and water resistant using a 3 layer material that maintains a breathable warmth-to-weight ratio. 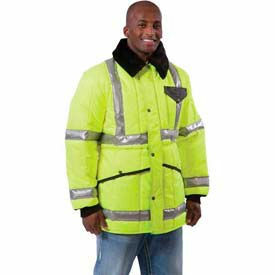 Features four 360° horizontal sleeve, two vertical, and two 360° horizontal 2" wide reflective stripes spanning jacket for increased safety and visibility. Available sizes are S, M, L, XL, 2XL, 3XL, 4XL and 5XL. Color is Fluorescent Yellow/Green/Charcoal Gray.